Despite having cerebral palsy, 4-year-old Kya Crowe can now enjoy being mobile all by herself in a new pink Jeep. 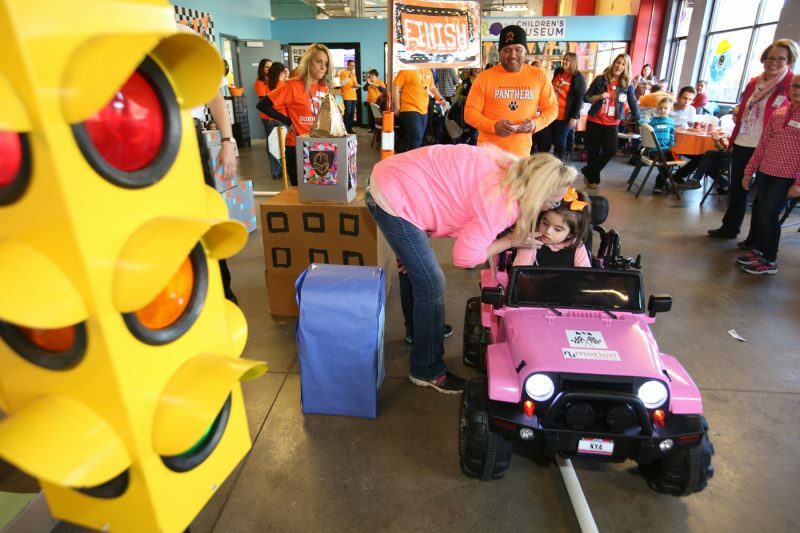 The minute Kya Crowe realized the adapted Power Wheels Jeep was hers, she began kicking her legs, giggling and pulling in her fists close to her chest — a habit of hers when she’s overjoyed. 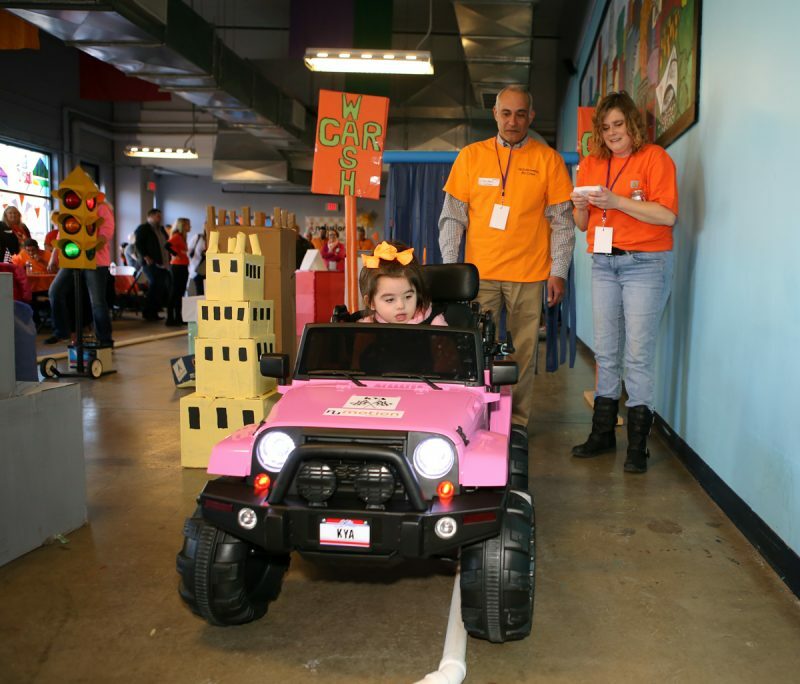 Kya was 1 of 7 participants included in last month’s Inclusioneers Adapt-a-Car Workshop, which modifies ride-on cars for children with disabilities so they can better participate in the action. Akron Children’s Hospital and the Summit County Developmental Disabilities Board identified candidates, and the local nonprofit that seeks to solve engineering challenges for the disabled selected the final participants. At top, Annabelle Reisinger, age 1, and Kenny McKeon, age 2. Saying they love their new cars is an understatement! 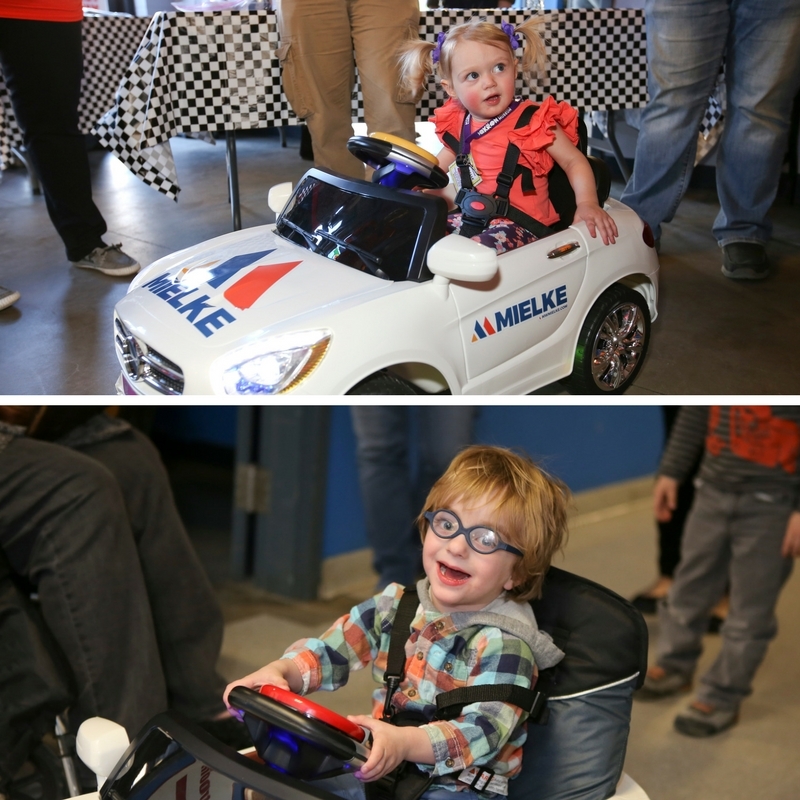 During the event, the kids tested out their new rides on a makeshift racetrack, while proud parents and family members cheered on the sidelines. 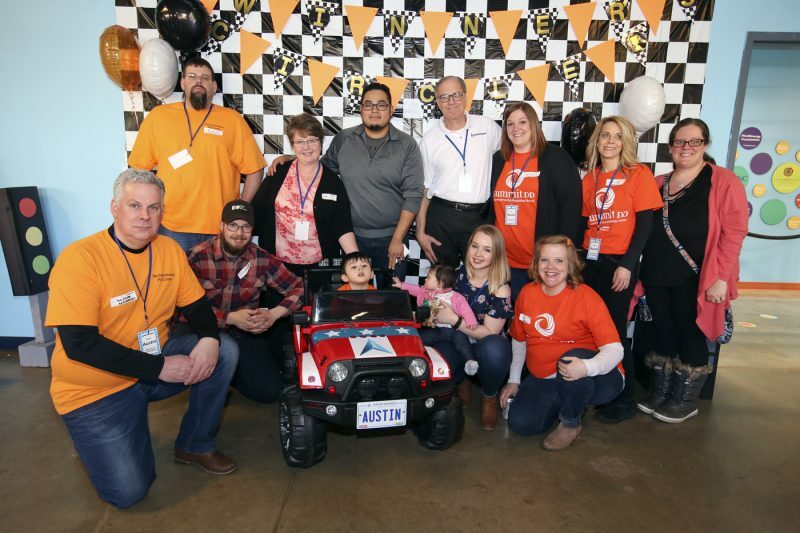 Each child had his own pit crew, which consisted of the engineers and sponsors that helped modify the vehicle, and a winner’s circle across the finish line to snap pics with everyone involved. Austin Cruz, age 2, has a big pit crew and several family members to enjoy “race day” with him. 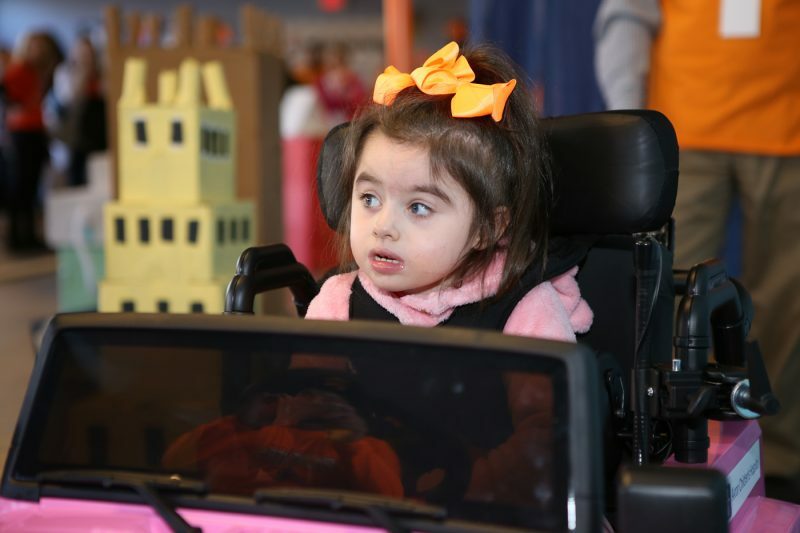 When it was Kya’s turn to take a spin in her new ride, the pit crew helped her in and made sure their modifications to the Jeep fit the 4 year old accurately. Once Kya was positioned correctly, they showed her how to make it go and instructed her mom on how to steer the Jeep using a remote control. After Kya got the hang of it, she didn’t waste any time and took off instantly. Kya gets safely strapped in. Kya has vascular malformations in the frontal cerebral cortex of her brain, or cerebral palsy. She leans on her mom and others for all of her daily functions: She can’t walk, talk or eat by herself. She has little head and trunk control, requiring support for sitting and standing, but has mobility of all her limbs. 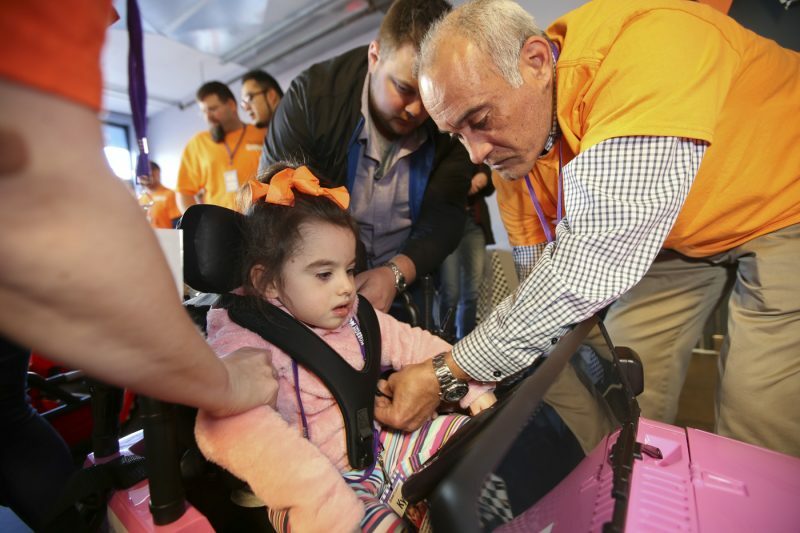 The engineers, which included University of Akron students and sponsors — Numotion and Miller’s medical equipment supply — took into account Kya’s limitations when adapting the Jeep for her. They disengaged the gas pedal and instead added a toggle switch for Kya to kick in order to move the Jeep forward. Then once released, the vehicle will stop. They also designed a custom seat with a 4-point harness and head array to support her while driving. Lastly, the engineers built a remote control so someone could steer the vehicle, while Kya controlled the speed. Per Kya’s request, the Jeep was pink, and came complete with vanity plates that display her name and a docking station for her iPad so she can play music while tootling around her neighborhood. “Inclusioneers is a wonderful program that has included so many kids with many kinds of abilities, and we’re so thankful to have been a part of it,” said Tracey. Kya cruises around the city after going through the car wash.
Born early at 36 weeks, Kya wasn’t meeting typical milestones and began having seizures at 2 months old. Shortly after being transferred to Akron Children’s Hospital from Marietta Memorial Hospital, the doctors here discovered the extent of her disability and Kya began therapy at 6 months old. Since then, Kya has undergone a tonsillectomy, ovarian torsion, eye surgery to correct a cortical visual impairment and had a gastrostomy tube, or G-tube, inserted to deliver nutrition directly into her stomach. Every week, she returns to Akron Children’s for occupational therapy to build skills for daily functions; physical therapy to encourage movement and strength; and augmented communication therapy to learn how to communicate using a modified iPad. Kya gets lots of love especially from her mom, Tracey Bloomfield, and her mom’s boyfriend, David Lakin. 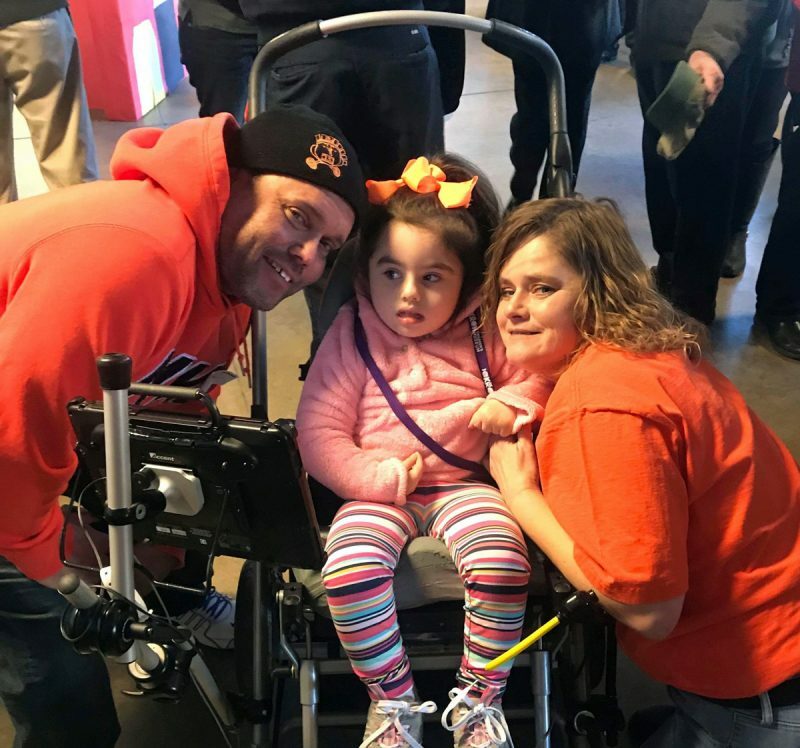 When she’s not in her new Jeep, Kya is carried or pushed in this adaptive stroller with a mounted augmentative communication device within reach. Kya also sees numerous doctors here each month to address medical concerns. To name a few, she sees Pediatric Neurologist Dr. Ian Rossman to monitor the malformations in her brain and control her seizures; Pediatric Pulmonologist Dr. Gregory Omlor to address her chronic respiratory failure and asthma; and Pediatric Physiatrist Dr. Micah Baird to oversee her physical therapy plan of care. Kya also receives palliative care to ensure she has what she needs to function on a daily basis. With an impressive medical provider list such as Kya’s, it’s no surprise she’s her own little celebrity — or superhero, in many minds — at Akron Children’s. When she first arrived here, no one was sure she’d ever move. Now, at nearly 5 years old, she’s come so far to the point where she can now tootle around in her own Power Wheels Jeep. Though nobody’s quite sure what the future holds for Kya, her family is hopeful she will continue to get stronger and develop her skills to function on a daily basis. This new Jeep is a step in the right direction.